South Africa has been treated to an overdose of legal arguments as its Constitutional Court grapples with whether or not a parliamentary vote of no confidence in President Jacob Zuma should be conducted by secret or open ballot. The country’s opposition parties are trying to get Zuma removed. Their latest attempt was triggered by his irresponsible decision to sack Pravin Gordhan, the widely respected finance minister. I sat and listened as lawyers for both parties argued their cases before the constitutional court judges. I’m a political scientist, not a lawyer. I therefore deserve the label “layman” and my understanding of what’s at stake should be understood within that framework. I take this liberty because, while the matter is patently legal, its origin is political. This is obvious from the fact that some political parties and civil society groups have declared their wish that Zuma be removed from office. And, whatever the court decides, the reaction by interested parties and the public is bound to be political. Following numerous failed attempts at securing a vote of no confidence against the president in parliament, the United Democratic Movement (UDM) and others decided to approach the court. They hope to secure an order instructing the Speaker of the National Assembly to let parliamentarians cast their votes in secret. The UDM took this route after the Speaker turned down its request for a secret ballot. The Speaker’s position is that she is neither obliged by the Constitution, nor permitted by parliamentary rules, to allow MPs to vote in secret. 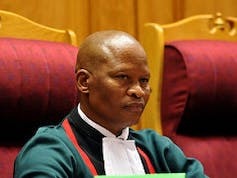 In a nutshell, the UDM wants the Court to declare that the Speaker is constitutionally obliged to allow a vote of no confidence by secret ballot. Alternatively, it wants the court to say the Speaker is permitted by parliamentary rules to do so. Understandably, lawyers for Zuma have opposed both sides of the UDM’s argument. The trouble here is that the Constitution states categorically – in Part A of Schedule 3(6)(a) – that a President must be elected by secret ballot. But there is no equally explicit provision that says a vote of no confidence in the President must be decided by secret ballot. This has created a lacuna to be exploited by various parties. Those calling for a secret ballot contend that the Constitution enjoins MPs to hold members of the Executive to account. Therefore, they argue, it goes without saying that a vote of no confidence – the highest form of holding a President to account– must be conducted in a way that ensures the highest form of protection from negative consequences. The secret ballot, the UDM argues, would give MPs, especially those from the ANC, maximum protection against retribution by the President and the governing ANC if they chose to vote with the opposition. This is what is termed “purposive” interpretation of the Constitution. It says that the purpose of the drafters of the Constitution was to ensure maximum accountability of members of the executive. The UDM contends that any form of oversight by MPs that leaves room for possible punishment by members of the Executive would not be in keeping with the spirit of the Constitution. It would seem that the Constitutional Court is dealing less with a clear-cut matter of legal facts, but more with a philosophical (jurisprudential) question. The Court is being called on to infer the intention of the drafters of the Constitution, or to interpret the Constitution in way that would, unavoidably, reveal the judges’ philosophical inclination on a morally fraught matter. The question is a moral one because fundamentally it’s about the conduct of a President who has been flagrantly injuring the interests of the country. While the justices of the Constitutional Court are men and women of law, they are learned and conscious enough to appreciate the contextual weight and social implications of their judgments. This is not to drag judges out of the neutral province of law into the entangled web of politics. It is to sharpen the question they are confronted with, and to crystallise the philosophical call to be made. Confronted with the spectre of a rogue president, would the drafters of the Constitution have chosen to grant MPs the maximum protection, enabling them to decide whether or not to rescue their country? If the judges can’t establish how the drafters of the Constitution would resolve this conundrum, they should put themselves in the shoes of a morally sound person who must choose between saving their country or letting it go up in smoke. This, essentially, is the moral dilemma confronting the Court. Do the judges craft a jurisprudential judgment that will protect their own country from a president who is on the rampage, or do they wash their hands and deliver a judgment cloaked in legal technicalities that would facilitate the ultimate ruin of the Republic? No amount of factual inquiry seems sufficient to prove the truth of a general conception of social order. Indeed, South Africa’s judges are not dealing with facts about truth. They have been called on to resolve a conceptual question about the best social order for posterity in South Africa.